1430 - latest: Ardern’s just finished taking on PM Bill English with her first question as leader in Parliament’s Question Time. English before Question Time crossed the floor and shook Ardern’s hand, and congratulated her on taking on the position. But it could be said Ardern did bring something different to it, taking notes of English’s answers, perhaps thinking on her feet a bit more – in response to English saying something was “last winter’s problem,” she came back with her next supplementary beginning with “If the issue is so last winter, then…”. Small things, but slightly different. Ardern in a press conference earlier said she would look to add to Labour’s policy platform further to what Little has stood on – she wouldn’t rule out a more substantial tax policy. In Parliament, it was made clear that existing housing policies would stay, with Ardern asking English if he would join her in promoting Labour policies including banning overseas house buyers and mandatory insulation in rental homes. I want to take stock for a bit. What will be clear to people though - it is a generational difference. 1353: A look back at Ardern's press conference - she says she'll be reconsidering Labour's election policies. He’s fought the good fight, but at the end of the day he was a victim of the transience of the polls. We can say what we like about polls, but at the moment the picture is bleak for a number of parties. Jacinda and Kelvin will know that they have taken on a big job, some will say an insurmountable task, but we tender our congratulations. She says she came in to Parliament when she was 28 and is "confident" and "competent". 1228: Kelvin Davis says Maori Party will need to up its game if it wants to work with Labour. 1227: Political commentator Chris Trotter tells Newshub: “I think Grant [Robertson] will be looking upon the scene with a certain wry, amusement,” having come so close to being leader himself. 1216: Ardern: “It’s not what anyone expected or wanted... We will be positive, organised and ready." MOU with the Greens is “absolutely in place”. “I will bring a different stamp to this campaign.” Ardern vies she’ll bring “relentless positivity” and “a clear vision for New Zealand”. 1211: Ardern does press conference. Kelvin Davis stands to one side of her and Grant Robertson to the other side. 1158: The Maori Party's announcement is huge. See this story Alex Tarrant did last month after catching up with the party's co-leader, Marama Fox. She said the party was ready to put aside "old-school" animosity towards Labour as it eyed the kingmaker role. 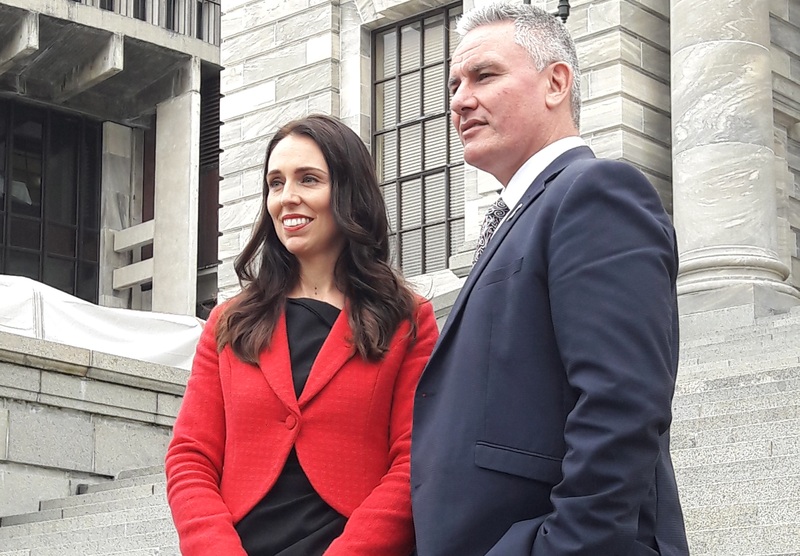 The Māori Party is calling on the new leader of the Labour Party Jacinda Ardern and new deputy leader Kelvin Davis to work with them in the best interests of Aotearoa. "Māori people throughout the country are telling me they want our party to work with Labour if it's in a position to form a Government after September 23," said Māori Party president Tukoroirangi Morgan. "We've always said we'd work with both sides, blue or red, but Andrew Little killed off any hope of that happening when he closed the door on us. "We're hoping Jacinda and Kelvin won't be as closed minded and that they’ll agree to work with kaupapa Māori. "Like Labour our party is concerned about more than half the prison population being Māori, not enough Māori people owning their own homes, whānau ora not getting enough funding to make the difference we want it to and the shocking number of people sleeping in their cars and on the streets." 1137: Prime Minister Bill English has told Newsroom Labour is in disarray, but he has cautioned against complacency among his supporters. "The basic problem is not really the leadership it’s just that they don’t have a positive view about what New Zealand can achieve," he said. "But we’ve got a lot of hard work to do, because they will select a new leader. The polls indicate that we still don’t have enough support to form a strong Government after the election, so it’s going to be a tough competition." Asked about the likely mood in the National caucus meeting, he said: "I think it will be a bit subdued. These are the consequences of making poor political judgments, not having policy, for the Labour party. It’s got to deal with those consequences, but there will be no complacency in our caucus because we don’t yet have the levels of support that we need to have to be an effective, positive sort of Government after this election." Jacinda Ardern, MP for Mt Albert, has been elected unopposed as the new Leader of the Labour Party. Kelvin Davis, MP for Te Tai Tokerau, was elected to the position of Deputy Leader, also unopposed. The decision was taken at the Labour Party Caucus meeting today, following Andrew Little’s decision to step aside from the leadership. 1105: PR consultant Matthew Hooton has told Newstalk ZB he thinks Ardern will fail. "I think she's an absolute flake but obviously Labour Party caucus knows her better than I do and feels she's the right person to fill the shoes of Savage and Fraser and Lange and Clark." Hooton says Ardern may succeed in salvaging some popularity among voters, but he can't see her forming a government. 1059: Former Labour Party President Mike Williams has just told Newstalk ZB: “I think this could be the game changer that the Labour Party needs.” He says Ardern is a “woman of great substance” and someone National “lives in fear” of. Williams says Little has a "strong and engaging personality", but lacks “cut through”. 1051: Sounds like it will be Ardern, with a press conference earmarked for midday. At 2pm the new leader will lead Labour into the House for Question Time - Parliamentary business doesn't stop for leadership changes. 1049: Jacinda Ardern expected to make an announcement. 1013: Little says a new leader will be a "fresh face" and a "fresh voice" for the party. 1009: Little: "It was my choice. It was my judgement." 1007: Little believes Jacinda Ardern will be nominated the next leader. He backs her. 1005: Andrew Little is stepping aside as Leader. 0945: Andrew Little has called a press conference at 1000 - before the Labour party caucus. 0925: Ardern, arriving at Parliament, reported as saying Andrew Little has had her full support the entire time. Other MPs making comments like 'it'll be an interesting caucus'. Well, they always are after polls like these. 0920: Three's Patrick Gower reporting Phil Twyford has ruled out running for the leadership himself but refused to say whether he'd vote for Little or not if that question comes up in caucus. Gower says relationship between Little and Twyford after this might be difficult. Twyford is Labour's campaign manager. 0915: Let's just remember that on current polling Little might still be able to form a government with the Greens and New Zealand First. That's if the Greens and NZF can work together somehow. I still think the option is attractive to Winston Peters as that gives him his best chance of a very nice title (PM for a year?) and a large policy platform. Peters might get even more control as Little is in serious danger of not being in Parliament himself. If Labour returns its current 27 electorate MPs then the party needs about 23% to start getting list MPs back in - Little is only on the list. A lot could rest on whether the Greens come in with a bigger vote than NZF on election day. 0855: RNZ again has spoken to Kelvin Davis, who reportedly said he was not aware of a challenge, but "who knows..."
0850: Fairfax reports Labour whip Kris Faafoi is running the numbers for support for Ardern and Davis. Meanwhile, political scientist Bryce Edwards - who has a number of connections on the Left - has tweeted that a Labour insider told him Little had changed his mind over stepping down, and decided to fight on. Reports are that Little held crisis meetings last night in Auckland with senior party members. 0840: RNZ is reporting Andrew Little told one of its Parliamentary reporters at Wellington airport that he was not going to resign as leader at caucus, nor call for a confidence vote in himself. Little did say, though, that he expects the matter of poor polling to come up in caucus. Three's Patrick Gower says Phil Twyford is one who wants to be the next leader of the Labour Party. Gower says Little appears to be holding out to see who leads the challenge as if he knows Ardern doesn't want the job. 0830: Here's something to watch: Maori Party co-leader Marama Fox has raised the prospect of new Labour Party leadership being more open to working with the Maori Party. For those interested in Fox's stance, read my interview with her from early July where she reckons the Maori Party support base is ready to put aside animosity towards Labour which largely sits within the 'old-school' wings of the party. Andrew Little is seen as a roadblock to the Maori Party getting into the tent on the Left. At a stretch, we could start talking about how possible a Labour-Greens-Maori Party government could be, leaving out New Zealand First, although on current polling that's certainly not possible. 0820: RNZ's political editor Jane Patterson reports one of Labour's more centrist MPs, Stuart Nash, has turned up at Parliament this morning saying he didn't know what was going on. Stuart Nash was reported as saying yesterday as saying he backed Little 100% - it's certainly less equivocal now. Paterson said there won't necessarily be a challenge to Little - that the decision is more likely in his hands on whether to stand down. Housing spokesman Phil Twyford - a dark horse leadership contender if Ardern doesn't get the job - was a bit less clear, saying he backed the leader of the Labour Party, NZ Herald reports. 0810: Of course, it's not clear-cut. Others have suggested there is potential for Little to still walk out of the caucus meeting as leader. However, former party President Mike Williams told Radio NZ's morning report that he believes this will lead to a split in the caucus. Williams said his own view is that Little will stand down. 8am: Good morning. Labour Party leader Andrew Little will face his caucus just after 10am on the third floor of Parliament Buildings. Little cancelled all media appearances Tuesday morning. Newshub has reported Little will face a vote of no confidence during caucus. If any new leadership emerges, Fairfax was told Jacinda Ardern as leader and Kelvin Davis as deputy is the most likely ticket. Three polls made public over the last 48 hours have triggered the speculation. On Sunday, the 1 News Colmar Brunton poll showed Labour on 24% support, then on Monday a leaked UMR poll (Labour's own pollsters) showed the party on 23%. This poll was likely given to party leadership mid-last week, and appeared to be the trigger for Little approaching members of his front bench offering his resignation. That was reportedly turned down at the time. On Monday night, a Newshub Reid Research poll also showed Labour on 24%. For more background, and my thoughts on how the party could get out of the rut it's in, read my piece from Monday: Labour has a problem, but there are ways to fix it: A simple platform that would appease voters who left; Stay away from complex policies that attract negative reactions & scare National's swingers. And get a proper tax policy again. Because we're within three months of an election, a new Labour Party leader can be elected just by the Parliamentary caucus, allowing the party to get around the drawn-out process of going through the membership and union aspect of the vote. Morning, all - keep hitting refresh on this page through the morning for more updates and background. ... the Baby Boomers will be shaking in their exquisite designer UGG boots , Alex ... Gen X is on the march ... Gen X are at the gates of the Babyarians ... banging on the doors ... " your time is up .... we're here to take over ... "
And aboot time , too ! If they change leader just before the election it's very likely they will lose a lot of their potential votes. Even if they change to someone that's exceptional there's not enough time to recover or push ahead. The fact that they are doing this now shows how stupid Labour is. I disagree. Little obviously doesn't believe he has the goods to get Labour over the line hence his questioning whether he should remain leader. If they're going to make a change they have to do it now while there's still enough time. Ardern cleaned up in Mt Albert, she's their only hope. They should have got rid of him at the start of the year, he was just as useless then. If they change leader look at the polling a couple of weeks before the election and see if there's any improvement. I think it all comes down to how good Ardern really is. If she's 'got it', then it's not too late. She can take the bull by the horns, show true leadership, a fresh approach, and demonstrate unity. If she is as flakey as some think, then there isn't much hope. Ardern is no match for the heavyweight female leaders of National, who have been around longer, with more expertise and experience. It is a fallacy to believe that Ardern is that popular to ensure a Labour come back. Watch her burn slowly from now to Election date. If you are talking about Paula "never deliberately" Bennett or Judith "Crusher" Collins, then I think Ardern is a sight for sore eyes. ... go go go , Gen X ..... ta ta to the rich complacent Gnatty BB's !!!! Actually I don't give a stuff about her teeth just about her policies but I do object to Ocelots comments re sight for eyes. Irrelevant. All she has got to do is come up with well reasoned and workable policies to fix the countries present problems. Perhaps they just don't want to win the election and accept Nationals poisoned chalice of imploding property markets since that what's most of this countries revenue has been based on in recent years. Either way it's still a mess and one that National won't be able to clean up. You could also take the Greens anti Winston stance as throwing the election. However if you're going to throw the election you'd keep the leader rather than make the new leader look bad. Unless of course there's a queue of Labour MPs who are worried they'll lose their job (this could be the case but I haven't checked the numbers). There would be an element of natural justice in National winning this election and having the landmines they've set explode under their own corrupt arses, rather than blowing up the incoming cleaning crew. Same policies different salesperson so Labour is incredibly stupid. Totally agree. Swing voters are repelled by this sort of chaos. If they change now they are history at this election. Meanwhile - National's numbers have slipped to 42% and half of National's MPs careers, rely entirely on Winston propping them up. How is that going to work?, their respective polices are not compatible. This is the real story, that the MSM will not acknowledge - hence the pile on Labour. The numbers for the left block remain the same - roughly level with National. Just imagine a if we had a straight media - highlighting every night - that the numbers are even - game on. Winston is pragmatic enough to work with whomever will be in a position to provide him with the baubles of office. It's the reverse the Green don't want to work with him. They don't seem to give a damn about actually forming a Government. NZ leaders or potential leaders need to nurture / create a perception of strong, wise, confident leadership (in their party or as ruling party). I do not get that vibe from labour or her policies. With the potential financial & geopolitical drama's that are possibly in our near to mid future do we want people that are learning at the helm or do we want more weathered leaders? Labour are clearly in trouble, not so much the individuals, but the party. It is clearly fractured and has been for a while. The constant infighting, leaks, and power plays, have yet again seen them snooker themselves right before an election. - Keep the current leader in play, effectively forfeiting the election, with the sole intent of him taking one for the team come election day. - Install a new leader into a campaign that is doomed from the outset, and who history would suggest wont make it until 2020 anyway. Plus they have the added benefit of possibly having to to take the bullet anyway - particularly if the decline hastens. It's lose/lose. and the entire country suffers. You can't have a good government without a good opposition. The results speak for themselves - we haven't had a good opposition for 9 years, and it looks like another 3, 6, or even more given the current outlook. Don't forget the National Party was in similar disarray until Key stepped up. Once it was clear Key was going to be popular with the public, the infighting evaporated and everyone pulled in behind. A popular leader produces stability it seems. Like it/acknowledge it, or not. It's true, its all about popularity. I am no fan of Key, but he had a good backstory. He grew up poor, worked hard, made money, then went into Politics. It's your typical rags to riches type tale. I don't think Ardern (or anyone else in Labour) have that same ability to generate support.Grew up middle class, never worked a "real" job, has nothing really to show for her "Labour"s, and went straight into politics out of Uni. It wont exactly endear her to the everyday Jane/Joe, who already think there are too many snouts in the trough. I expect the infighting to continue, and at least one more leader before the 2020 election. Believe she is naive to take it on now. In fact one cannot help but wonder if she is naive full stop. Clark was deputy to Palmer but stood aside to have Mike Moore, bravely & with huge selflessness, be on the bridge as the ship sailed resolutely on to the rocks. Clark inevitably, then knifed him as/when it suited her. Who says history never repeats, apart from Split Enz, that is. I don't think she is naive. I just think she has that insatiable need for power. Watching her on the TV news she was smiling like the Cheshire Cat. Cruel! But yes, a self admitted disciple and facsimile of Helen Clark and difficult to recall any greater thirst or grip, with concern to power, than that. Well since Muldoon probably, but it would be a toss up between the two. Isn't now the only chance for the Labour caucus to decide who they want to be their leader without the pesky party membership and unions having their say? Given that that crowd is really only ever going to vote for Labour, this is their chance to get a leader with broader support. That's not necessarily an undesirable trait, providing the person is committed to working hard and doing as well as they can to help others, and has ambition to make NZ a better place. I felt (after believing him and voting for him twice) that John Key's ambition was unfortunately primarily to be Prime Minister, and this was behind his accumulation of political capital that he ended up NOT spending on actually getting anything much meaningful done. He wanted to be PM, he achieved that, he hung around, he left. That will be the Nats/media 1st new attack line. More irrelevant crap from our craven media, anything other than focusing on National's dismal performance, coalition troubles, or lack of meaningful policy - seems like another policy free election - no guesses who that will favour. Maybe it will be a good thing the Nats and their fawning media acolytes, get to own their own mess for a couple more years . The best leaders don't ask for the job. Those who don't want power are the best people to have it. It would be a dumb move by anybody to take over from Little this close before the election. It would be you tainted with the coming defeat. If you wanted to take over from Andrew and had any brain at all, you would be desperate to avoid becoming the leader now - you would be keen to wait. I'd sooner vote for someone who is well meaning and wanting to put citizens and residents needs first, rather than a self interested corrupt party who are willing to sell out this lovely country to the highest bidder just so they could make a quick buck. With National its all about the rich getting richer and the poor getting homeless. Just think I voted for National just so I could make money, shows that my shallowness, was not good for me or the country. Not sure about Labour either, but I cant stand another 3 years of a party calling our young druggies and bringing in unlimited immigration to work in restaurants. Our fish and chips are woeful now, so not sure how good these workers are. What they should have done is kept Little and got rid of most of the rest, but I'm not a Labour supporter so it's academic. Interesting ideas from John Campbell interviews last night with the bar inhabitants of the "Hotel formerly known as the Blackball Hilton" - the birthplace of the Labour Party. Their view, as lifelong Labour voters was they would vote for Damien their local MP, and that Little was fine in that he represented the 'working stiff'. However they regarded the rest of the party as suspect and had lost it's way. The current Labour party MPs did not represent them. I think they were thus going to vote for New Zealand first. Little endorses Ardern. He must really really hate her. At least he got an early warning. Mt Albert was the signal he was never really going to be leader. Does that mean house prices will go up again? No he didn't sell, he flicked. Turei is a benefit fraudster and should just disappear quietly. Typical Labour, when an honest reasonable leader is found, they shaft him! John Key must be regretting quitting. He would have made history with a fourth term, which is a sure thing now for National. There's still the housing mess and economic migration ponzi he nurtured through inaction. I'd doubt he's regretting quitting. We now have a leader of one of our major political parties who has publicly stated numerous times that she doesn't want the job and has no interest in becoming Prime Minister. Get ready for the real possibility of Winston as PM. She "doesn't want the job" eh? Remember Toranaga (the Shogun). I'm not sure how it works over here, but in the UK no-one serious would admit to wanting the top job outside of a leadership campaign. Don't shoot until you see the whites of their eyes, too embarrassing if you say you want it and don't get close, or if you end up as deputy or worse after making it clear you wanted more. There is always taking one for the team. Labour should merge with NZ First. That never stopped John Key. Maybe we as Kiwis are just that shallow now. I think, like me, you better take another look, that is actual steel in those eyes, I now see. If Jacinda cuts away from the Greens and goes it alone, maybe they can get in with Winston. Clarke her Boyfriend is up for taking risks so maybe she has the personal support to do this. Greens are bad for everybody including the environment so hopefully she cuts them loose to float away to Antarctica where they belong. Peters will need to think carefully about doing a deal with the fraudster Turei. The lizard has a significant number of blue rinse and disaffected centre rightist ex Nats as supporters and they will not look favourably on Turei's open anarchism and the marxist economic views of her colleagues. Is lying about benefit fraud worse than telling the truth about it? Don't understand. Are you saying that Ms Bennett is lying about having committed benefit fraud? On what basis? From what I have read of their statements, it seems a few people who knew Paula Bennett well when she was younger are now accusing her of committing benefit fraud. I don't think it's safe to link to their testimonies here, so you'll need to research it for yourself. If the 'testimonies' are already published there is no risk in linking them. An oblique reference to the (unsubstantiated) accusations of others as a method to imply wrongdoing on Bennett's part, is pretty limp. No, really: "Retired judge warns public after Paula Bennett threatens lawsuit over online post"
But because I aim to help, here's something to get you started. They have already been established as uncorroborated accusations. Your referencing of them in the context of our exchange, even obliquely, implied veracity. Bennett has already explained what she meant by the word 'intentionally'. If there were proof of fraud or lies, I'd be at the first to call her out in the way I did the thieving Turei. But I suspect there is none, as her political opponents would have produced it by now. They have already been established as uncorroborated accusations. I'm not aware of any process that has been gone through. Do you mean National MP statements alone, as in Barclay and English's earlier statements establishing that Barclay hadn't recorded his staff? The Barclay debacle vs Turei's blatant fraud perpetrated against the public of NZ. Hard to tell which of these two things are kind of not the same ! I was asking re your "has been established", i.e. some process of establishing. The Barclay example highlights that a mere denial from a National MP might not mean much. This has changed nothing because voting for either Labour or National simply assures more of the same old same old. That so many voters in NZ do so is the major reason why the smaller parties have been unable to evolve. Of course sufficient change may not happen after one election but its high time we voters start to think longer term. Two party systems do NOT offer choice. With the possibility that our economy may suffer quite a hit over the next few years we have little to lose by being more experimental. National and Labour do not offer solutions. Indeed a policy of over flooding NZ with new persons to feed, home and healthcare will create even more social prolems than we currently have. We have become a social disgrace. Any chance of having a poll on interest.co.nz for members to vote in? (anonymous of course). I'm curious to see how this election pans out. The whole no confidence thing (i.e. Trump/Brexit results) means who knows where Winston's final results will end up? It wouldn't really tell us anything, though - would it? It stinks of sampling bias to me, at least. They had a poll like that previously, but neglected to cut off voting after one click. It was possible to just vote repeatedly for whoever. Unless policies are over haulled,what has changed apart from the messenger. We are turning into a pretty shallow bunch of voters. Was just talking to a female friend - said she might vote for Jacinda but would never vote for Andrew Little. Knew nothing of her history or policy of the party. Looked nice was the deciding trait. I think Jacinda is really good but could there be a bigger hospital pass in political history? I can't believe I'm writing this but Winston is a 50/50 chance of being PM. Winston may be more keen to be Deputy PM. No chance. He was Deputy before back in 1996. He's going for PM if Labour/Greens/NZF make up coalition. Otherwise he'll go with the Nats. A bit before my time, but didn't Geoffrey Palmer only have about 20% polling before Mike Moore caught the pass? I think he almost won in the end. Even with the current poling, Labour are a definite possibility of forming a government with Greens / NZ First. If Jacinda can steel 3% from National which seems reasonably likely, then the election will be decided by Winston. Does anyone want to analyse why did the Labour party lose support in the last few poles? isnt that what really prompted Little to fall on his sword? I think that that is the core issue here .. shooting the messanger (Little) or changing horses this late in the piece could actually mean little ... was it Little's fault or was it the Party's popularity among swing voters or supporters which brought the ship down?? I suspect that swing voters will steer towards National to avoid a big mess after today's fall out ...few more poles will put the last nail in the coffin. Yeah you think National can rescue you? Sorry Eco Bird you're still f##ked! Auckland is in the midst of a property correction and is on course for a crash. RE is Hard solid fact on the ground , built in brick and mortar ... political parties are like a fog, some stick on and help nourish the gardens, others are just blown away by the prevailing western wind ...people come and go BUT RE remains where it is ... I hope you can at least get that bit ! They would have been far better to bring in Grant Robertson. I can't really understand why they wouldn't. They have lost my vote, as IMO this is just desperation and shows a party in disarray. MAybe they are trying to appeal to the younger voter, I don't know what they are thinking. IMO she is too young and without the experiences age brings, and as a result I can't see the leaders debates going well. Also didn't she recently say she didn't even want to be leader? The greens are going to get even more votes, and wouldn't be surprised if the Greens become the main opposition party, as they have cleverly become a more left version of the Labour party, although they probably need to change their name. Question. Did they ever have your vote? I actually voted Labour 3 terms when Helen Clark was at the Helm, as National was in disarray and focused on selling all the silverware without solid (apparent) plans for growth and got too tangled in the big boys club ... But changed my mind when they brought in John Key and Labour started its holy descent ... Leaders and Teams Do matter, experience, networking, connections, and vision Matters ...the rest is all subject to negotiations ( most of the time). People who stick blindly to their ideological principles fail the country and the common good - No single rugby team can win all the time !! and there is no point in betting on a losing Horse, even if it was your own!. Yes they have in the past. This is great news, I was leaning towards the greens or even NZ first. I think jacinda can turn this around. They said trump and and corbym had no hope and look at what happened there. Little was doomed leading into the election... Jacinda just could be the catalyst a glimmer of hope ,someone young and less jaded to save us from what was looking like another term for national. She has my vote I think some could be suprised at how many people are waiting in the wings for some kind of spark from labour. the news is so good today that the share market is not even taking notice of it !! Just like trump and corbyn what happened was apparently impossible. People are ready for change, some new ideas dont really think labour have too much to lose from this point. huh...whats your point? I am saying Arden could get any sort of momentum like Corbyn did we could well see a Labour coalition. Trump won, and look at the mess in the US today and his admin and the fox traps he is avoiding every minute ... chances are he will be replaced end of his first term ... people will get sick of chaos and lack of leadership of the GOP. This coalition is doomed , before and after the elections... we have flimsy Labour team in damage control mode, A fraudster in Green proud of what she did and not backing away .. her naive team and blind supporters are hoping to Govern with a handful of questionable policies, and NZF team that will be blown away with a puff of hot air once its leader crumbles under pressure because of his over promising? Labour currently looks like a football team left to play only with the back benchers and the chearleader are still hopeful for a win, they know they cannot deliver and doing it to save face in their electorates. wally. If your key leader criteria are a high school prom photo look and being a greenhorn in high level politics, then I can see how Jacinda could be attractive. Experience, gravitas and honed leadership skills - all can be learned from a self help book, eh. yes yes you get it ...something different. Not the same old cronies. Lets try something new. Video of Ardern's first press conference as leader in there. Rob. Left leaning E channel watcher types who would have voted greens but who disapprove of Turei will swing to Arden. Davis will pull Maori voters from Winston and the Maori party. Labours slide should stabilise or even reverse. Agree with you about Robertson. Too Wellington beltway and smarmy for my personal liking but he's nonetheless a savvy operator and would have been a better pick. The unions doomed Labour when they forced in their own functionary, Little, ahead of Robertson. Maybe it will attract those voters swinging between Green and Labour. But they made their bed when they joined with Greens, which IMO was a big mistake, as it was lose lose for labour to do that this far out from and election. But frankly they should be trying to win National and NZ first voters, by actually having some attractive policies. There are many National voters who are not happy with the growing divide between rich and poor in NZ and the housing crisis. It appears labour are now trying to play the generation card due to having a very young leader, which is predicable. But all that does is create division, and potentially could turn off some of their older voters, who I wouldn't be surprised shift their alliances to NZ first. I expect NZ first to do well out of this. L for losers ........... I was hoping their housing and immigration policies would be full of fresh, new, ideas , but no , all we got was a lecture on what they did in the 1930's, a housing wishlist , " to make Auckland housing affordable " whatever that means , and more of the same with regards to relentless immigration . You have to wonder what they spend their time doing while in opposition, and why they aren't looking overseas for solutions. Why aren't they looking at the German housing solutions, where renters have secured rental periods, and get their own shell to live in and fit out. NZs rental system provides renters with no security, and they can be told to leave (with notice) whenever the landlord wants to get rid of them. About time. This move has finally put some personality back on the Left. Those who went from Clark to Key will just as quickly swing back to Ardern. You would hope that NZers wouldn't be so superficial to vote on personality, rather than policies. But then again most people in NZ probably don't have a clue what policies the parties stand for. You would be naive to think that people don't. persona, propaganda, persuasion, partisan, parents, peers, polemicism. Policy is a long way down the political pee list. Isn't the simple reality that leadership is more about charisma than anything else? You don't have to be smart though to have charisma. Some of the smartest people infact have zero charisma. I'm swinging back, upon todays announcement. It's about time we had a young PM. Kelvin Davis is fluent in Te Reo which is also refreshing, considering we had to endure listening to John Key butcher the maori language on a daily basis. Bless JK. She did an amazing job at her first press conference as Labour Leader... good on her..
She's good - always has been. The leadership debates just got a whole lot more interesting. Finally, the future arrives in NZ politics. She brings massive credibility simply because she isn't the old guard. Really? To me she brings no credibility. No experience, no CV, no track record in govt. I don't see what the attraction will be for swing voters. Changing leader just before an election just smacks of desperation and chaos. Bulk of her time was as a list MP. Yes an MP, but not quite the same accountability or mandate to represent a constituency as an electorate MP. She was then gifted Mt Albert, and still only managed to pull 1/2 the votes that Shearer did. Shouldn't you be kicking your octogenarian aunt out of her house? Mike Hosking! Seriously? I know you're a big supporter because he sneered at you in Remers once, but seriously... Mike Hosking? Talk about a credibility problem! Mike has every right to share his view and opinion of Ardern. Maybe you're not his fan, but I am sure a lot of his supporters would agree with him. And his words were spot on --- It is not a matter of supporting Mike, it's the logic behind the analysis ...which blindly biased people miss at times. True. World is changing and politics is changing. Look at France. Health - hide yer wallets, Positive tax increases coming. Housing - hide yer landbanks, Positive eminent domain coming. Expressed with positivity by the polititions as some kind of "solution" that will "fix problems.."
My favorite "positivity" "fixer" , at the moment, is Metiria turei. I wait in anticipation of what Jacinda Ardern is going to "fix"
I can't remember the last time a NZ politician fixed anything. I can remember numerous times politicians have put the fix on something, though. This will get Labour a lot of extra attention over the next few weeks and force National to play catch up. Almost like a planned move. Labour couldn't organise a piss up in a brewery but they want to run the country. Ms. Arden is a career politician that has only worked for the party. I can't see this been an improvement. Bill English is also a career politician. That's not the best angle of attack for National supporters, really. Im not voting for Labour or National. But national can only ruin a country with will full abandon, at least incompetence may slow down the mess national have created. Shows real tenacity to take it now. Thats what a true leader does they back themselves get in and start making change not sit on the sidelines and wait for their moment . I take my hat off to her. So, since Ardern does not want to be PM, who would be PM if Labour Green & NZ First get majority ? So , is this a Hospital Pass ? Or is she just taking one for the team ? She will get a bounce in the polls in the next week or two. Remains to be seen if a slide will follow ; I think it will - but it is hard to say. From an interview she did 2 years ago - "the next leader won't be her. She doesn't want to work the ridiculous hours, she doesn't want the acute spotlight of media scrutiny and having recently moved in with her partner, Auckland media personality Clarke Gayford, she wants to have kids. She can have these things as an MP but not as the leader of a party. Sure as heck not as Prime Minister." She's 37 years old. Time is running out for her to have kids. Maybe she thinks she can do both as Leader of the Opposition for 3 years, then run properly for PM in 2020? Andrew Little made a tough decision and it was good to see his party supporting him right to the end. Moving forward, if we learnt anything from the Bernie Sanders campaign, it’s to expect a fake news media black out, and relentless fake news negative media articles. It’s not going to be an easy transition to the top job. Is Ardern the first Labour Party leader with a boyfriend? Well, if it is a first then it certainly is relevant. It's reflective of changing societal attitudes perhaps? Once upon a time such a selection would have been unthinkable. Park Geun-hye of South Korea is unmarried, now in a detention centre, ...so probably not a good comparison. That a leader does not have to be a married male. Show stopper for me I'm afraid. It's his moral principles... bludging every last hard worked for cent from his tenants is all good. An unmarried female PM, is just a bridge to far! My question is that Jacinda is 37 years , no children , if she is planning children will she be around for a full term? I would have thought that the suitability of any potential Prime Minister would be everyone's business. That's what it's all about. Otherwise why is this interesting news? You are a bigotted dinosaur. Who knows maybe she can't have children. Please stop spreading more rumors. Totally inappropriate and bigotted / discriminatory. Editors - please ban this idiot. You are the one being an idiot Fritz. You're getting all emotional and White Knighty about my points which I am sure where discussed by the Labour party leadership prior to this decision being made. I suspect you will be banned. If not this website has a serious problem if it does not ban homophobic comments. You aren't that important Mr Fritz. Get used to it Fritz. It's about to get very ugly. They'll attack her from every angle because she's a bigger threat to National than Little was. I see the National parties biggest sycophant fan boy Mike Hosking has gone on the offensive, published on the Herald. Yeah it's not the first time you've made sexist comments on this site Zachary, cut it out mate! Eggs cab be frozen for later conception. Interest - will you ban homophobic commenters? If not, I am out of here. Homophobia is a discrimatory crime. No one has made any "homophobic" comments. Pull yourself together Fritz. Double gz posted a lesbian comment which he obviously retracted becuase he knew he overstepped the mark. It will obviously be trackable. As I said - ban him or I am out of here. I have not said anything discriminatory. You have clearly reacted in a wrong way. Crikey you're an unpleasant piece of work. DGZ is a wonderful person with a great sense of humour and with only good feelings regarding all the different types of people. I honestly believe that. It seems to me it is you that wants to make this ugly. I know a lot of commenters would love to see a market crash but is it so wrong that I have a different opinion? I'm sure nobody would like to sell their houses cheaply and make a big loss. I just think calling to have people banned is weird and grotesque. It's not the Kiwi way. Surely we can discuss marital status and so on and how it could potentially influence voting choices concerning potential leaders. They did it with Trump and Macron. Wives and husbands have to attend international events and host foreign leaders. If Jacinda did become PM it would be a groundbreaking development. It's a big risk for Labour yet we can't discuss why? How absurd! Also I ran the situation past my kids and I can report that their views are even more conservative than mine. If other commenters could do that and report back it would be quite interesting. Homophobia is unlawful, in case you don't know. I have a friend who committed suicide, largely a result of homophobia. I expect action from the editors. Fritz, it wasn't in the least bit "homophobic" and no offensive epithets were used. DGZ, perhaps not quite fluent in the subtleties of Kiwi discourse, was merely illustrating why you shouldn't spread rumours which he thought you were doing. Anyway it has been edited now so you should be happy. You're only being this embarrassing for political reasons I reckon. So you acknowledge you retracted it - or 'edited' it - in your own words. It was still posted, and it was discriminatory. You effectively admit that by admitting you retracted it. I don't know how you are allowed to survive on this website with your sexist, homophobic and arguably racist views. First, it is a baseless canard, and long running joke, that DGZ and I are the same person. Politically we are radically different. And second I believe people should support candidates that they identify with because candidates will act as their representatives in parliament. This is democracy, a government comprised of elected representatives. It is well within my rights as a citizen and eligible voter to truthfully express my opinion on this matter. Seriously can everyone give up on this. I don't care if Zachy has 50 different profiles. What difference does it make ? Time to put that to bed. Oh good grief... you are having another long winded conversation with yourself... we all know you, Zac and Double GZ are the same person. We are all friends of Dorothy. There's no homophobic comments or anything discriminatory here. Stop being so angry. So long , good riddance. I am sure the editors will be able to track the homophobic / sexist comments you posted and then withdrew. Does anyone else tolerate sexism and homophobia? Fritz, bro! Deep breath... breathe deep... there you go. Zac/DGZ's goal is to be as offensive as possible. Her/his goal is to get you to react... for the first time in a long tine, he/she and their ilk, are shitting themselves... there is a new contender who is challenging their self righteous status quo and is a very real threat to them and their boomer 'Elysium' mentality... let them rage, let them spew their vitriol... their time for gloating is running out! Yeah, they may seek to provoke in true troll fashion, but sexism / homophobia oversteps the mark. I am one who has long thought that Ardern is a bit young for this post, and was afraid that if she took this mantle on too early, it would destroy what could be a stellar career. Well, I think I may have been mistaken. I listened to her first presser today after the announcement and knock me down wiv a fevver, she OWNED the lot of them. If anyone can point me to link to it (late home from work today and a bit wore out) I will find the exact second she completely changed my mind. I think she may be way more formidable than her demeanour and physical appearance and age suggests. I have been unsure of her but she came across brilliantly today. Composed, articulate and focussed - with a sense of humour. Just spotted the addition of the vid of her first presser. Bear in mind I was listening to this on the radio, but at 7.59min was the instant I realised she is the real deal. She was in control. I am not sure how relatable she is to middle New Zealand. Is it fair that our prime time, tax payer supported tv is dominated by such a strident National advocate? Fritz nobody watches an aging has been rocker who was once famous on our equally aging State TV Broadcaster. So don't lose any sleep over it. Hosking is a jumped up little p**ck that looks in the mirror every morning and admires his own reflection. He is sexist and belongs to the old white boys club. Nobody cares about his opinions anymore! TV3 has all the real young talent and real journalism! You should see TV3 and listen to their sports presenter. Perhaps you should quietly give thanks to him, I reckon he just steered a lot of votes her way. Labour should include Jacinda's "we can do better" in their re-branding project. This will resonate with most people. "Everyone knows I have just accepted, with short notice, the worst job in politics"
Not only is that comment stupid Boatman, it also just doesn't matter. Is that the team that has male partners? For what it is worth, she has apparently stated in a women's magazine interview, the desire to have children , and has not backtracked from that since assuming leadership. Is a Prime Minister having a baby really that unthinkable?. Biggest things going for her, enthusiasm, positive outlook and energy. All of a sudden people are energized (on all sides of the political spectrum and the media). Something we haven't seen for a long time. And appeal to female and younger voters. LOL I rather save my energy for La Fourchette thank you.